Secrets and lies can't stay buried forever in Cedar Valley. In the summer, hikers and campers pack the small Colorado town's meadows and fields. And in the winter, skiers and snowboarders take over the mountains. Season by season, year after year, time passes and the lies, like the aspens and evergreens that surround the town, take root and spread deep. Now, someone has uncovered the lies, and it is his murder that continues a chain of events that began almost forty years ago. Detective Gemma Monroe's investigation takes her from the seedy grounds of a traveling circus to the powerful homes of those who would control Cedar Valley's future. Six-months pregnant, with a partner she can't trust and colleagues who know more than they're saying, Gemma tracks a killer who will stop at nothing to keep those secrets buried. Gemma Monroe has a good life in Cedar Valley, Colorado. She has a job she enjoys with the local sheriff's office. She has family that she loves, and she and her partner are awaiting the birth of their first child. Now if she could only trust her life-partner and her colleagues, things might be as close to perfect as possible. While Gemma deals with her lack of trust issues with her life-partner and colleagues, she must deal with a murder case that seems to open the proverbial Pandora's Box of secrets in her hometown. The murder of a young man with the traveling circus was strange, and the case becomes even more bizarre when the identity of the dead teen is revealed to be none other than the previously presumed deceased son of the mayor. Gemma realizes that the victim's disappearance three years earlier is probably related to his murder, so she begins to dig into his background and family. Strangely, her grandmother, who is suffering from Alzheimer's, warns her away from the grandfather of the victim. Gemma is then relegated to partnering a senior colleague on the case rather than leading the investigation. Adding to the overall strangeness of this case and investigation, Gemma is finding notes and messages in an attempt to get her to stop her investigation and then the newest deputy is severely injured in a hit-and-run accident. Is it possible that this murder could be tied to the town's previously unsolved murder cases from 30 years ago? I found Inherit the Bones to be a fast-paced and wholly engaging read. I enjoyed the small-town environment, the angst from Gemma's relationships with her life-partner, grandparents, and colleagues, not to mention the murder and its investigation. Yes, obviously there's a lot more going on in Inherit the Bones than a current murder and its investigation, but you'll have to read the book to find out for yourself. I enjoyed reading about all of the characters, especially the circus folk. The small town of Cedar Valley and its history is just as important to the story as the characters. 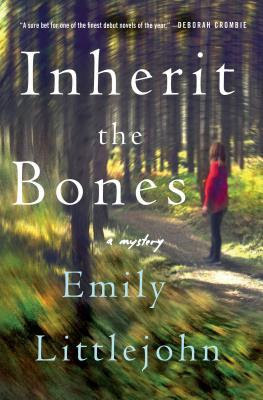 Inherit the Bones is filled with quirky characters, plausible scenarios, and intrigue upon intrigue that kept me reading until the end just to find out whodunit and why (no, I'm not going to tell you who did it or why . . . read the book!). Inherit the Bones is the first in a series by Ms. Littlejohn and I'm looking forward to reading more about Gemma Monroe in the future. Disclaimer: I received a free digital copy of this book from the publisher for review purposes via NetGalley. I was not paid, required, or otherwise obligated to write a positive review. The opinions I have expressed are my own. I am disclosing this in accordance with the Federal Trade Commission's 16 CFR, Part 255: "Guides Concerning the Use of Endorsements and Testimonials in Advertising."